February 2015 n Performance & Hotrod Business n 57 the other fender on a valuable Jaguar. But he was determined that if he bought the equipment, he'd have the equipment when the car was done, rather than spending the money for just a single part for a project. And, he ended up with nice tools for the next project. Some tools, even if you only use them once, are valuable. PHB: What are your top suggestions on how to get the best results from using these tools? Heck: Like a lot of things, a little trial and error helps as far as learning to operate the tools. Most of our tools are very simple. Some might be a little more complicated, like running an English wheel correctly. In that case, we have videos, books, and work manuals. PHB: Is manufacturer training provided? Heck: Customers are welcome to come to our showroom and try out the equip- ment. We also exhibit at trade shows where we demonstrate the equipment. Ben Romenesko Miller Electric Manufacturing Co. Appleton, Wis. www.millerwelds.com PHB: What are Miller Electric's most popular metal fabrication tools for use in hotrod and custom automotive shops? 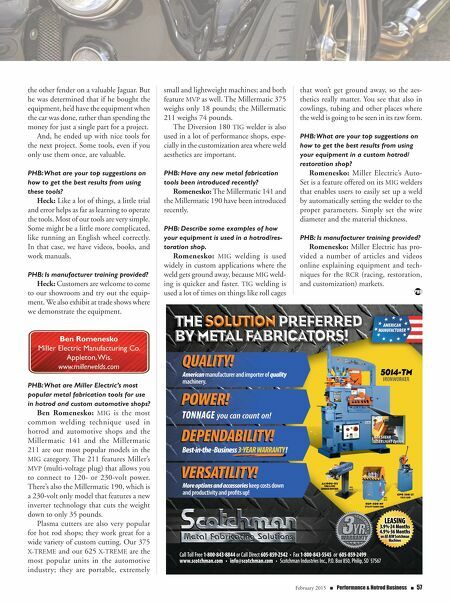 Ben Romenesko: MIG is the most common welding technique used in hotrod and automotive shops and the Millermatic 141 and the Millermatic 211 are our most popular models in the MIG category. The 211 features Miller's MVP (multi-voltage plug) that allows you to connect to 120- or 230-volt power. There's also the Millermatic 190, which is a 230-volt only model that features a new inverter technology that cuts the weight down to only 35 pounds. 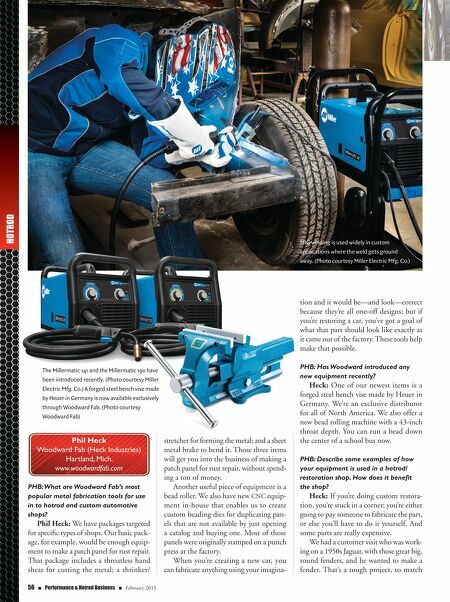 Plasma cutters are also very popular for hot rod shops; they work great for a wide variety of custom cutting. Our 375 X-TREME and our 625 X-TREME are the most popular units in the automotive industry; they are portable, extremely small and lightweight machines; and both feature MVP as well. The Millermatic 375 weighs only 18 pounds; the Millermatic 211 weighs 74 pounds. The Diversion 180 TIG welder is also used in a lot of performance shops, espe- cially in the customization area where weld aesthetics are important. PHB: Have any new metal fabrication tools been introduced recently? Romenesko: The Millermatic 141 and the Millermatic 190 have been introduced recently. PHB: Describe some examples of how your equipment is used in a hotrod/res- toration shop. Romenesko: MIG welding is used widely in custom applications where the weld gets ground away, because MIG weld- ing is quicker and faster. TIG welding is used a lot of times on things like roll cages that won't get ground away, so the aes- thetics really matter. You see that also in cowlings, tubing and other places where the weld is going to be seen in its raw form. PHB: What are your top suggestions on how to get the best results from using your equipment in a custom hotrod/ restoration shop? Romenesko: Miller Electric's Auto- Set is a feature offered on its MIG welders that enables users to easily set up a weld by automatically setting the welder to the proper parameters. Simply set the wire diameter and the material thickness. PHB: Is manufacturer training provided? Romenesko: Miller Electric has pro- vided a number of articles and videos online explaining equipment and tech- niques for the RCR (racing, restoration, and customization) markets. CPO 350 LT COLD SAW MFG. IN ES SUP-500 NF UTILIT Y BAND SAW MFG. IN NL AL100U- 02 TUBE & PIPE GRINDER/NOTCHER BAR SHEAR LASER LIGHT Option BAR SHEAR LASER LIGHT Option Call Toll Free 1-800-843-8844 or Call Direct 605-859-2542 • Fax 1-800-843-5545 or 605-859-2499 www.scotchman.com • info@scotchman.com • Scotchman Industries Inc., P.O. Box 850, Philip, SD 57567 LEASING 3.9%24 Months 4.9 %36 Months on All NEW Scotchman Machines THE SOLUTION PREFERRED BY METAL FABRICATORS! More options and accessories keep costs down and productivity and profits up! VERSATILITY! VERSATILITY! Best-in-the -Business 3YEAR WARRANTY ! DEPENDABILITY! DEPENDABILITY! TONNAGE you can count on! POWER! POWER! QUALITY! QUALITY! American manufacturer and importer of quality machinery.